Unwanted Click.admessage.support pop ups, notifications or ads, especially if those ads occur automatically and unexpectedly, can be indicative of ‘ad-supported’ software (also known as adware) installed on your computer. In many cases, the ad supported software installs on the computer in a bundle with freeware that you downloaded and installed from the Internet. Once it gets inside your computer, it will alter some PC system’s settings including home page, newtab and default search provider in order to redirect your’s internet browser to undesired webpages or show a huge number of annoying popup advertisements from various third-party ad networks. The adware that responsible for web browser redirect to the annoying Click.admessage.support web-page can attack your computer’s web browsers like the Google Chrome, Internet Explorer, MS Edge and Firefox. Maybe you approve the idea that the pop-ups from it is just a small problem. But these annoying Click.admessage.support ads eat machine resources and slow down your personal computer’s performance. When adware gets inside your PC, it might carry out various harmful tasks. It can analyze the location and which Net webpages you visit, and then show ads to the types of content, goods or services featured there. Ad supported software creators can collect and sell your browsing information and behavior to third parties. 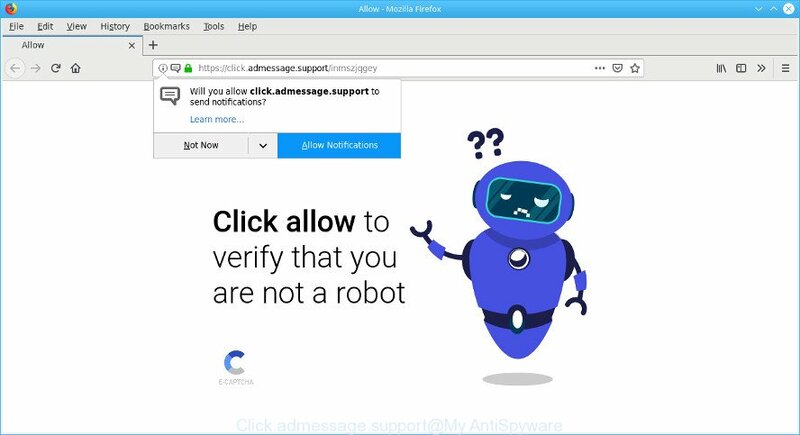 So, if you happen to encounter intrusive Click.admessage.support popup advertisements, then be quick and take effort to remove adware that responsible for web browser reroute to the intrusive Click.admessage.support web-site immediately. Follow the steps below to remove Click.admessage.support pop-up advertisements. Let us know how you managed by sending us your comments please. The ad-supported software is a form of malware that you might have difficulty in removing it from your PC system. Thankfully, you’ve found the effective Click.admessage.support popup ads removal steps in this post. Both the manual removal method and the automatic removal solution will be provided below and you can just select the one that best for you. If you have any questions or need help then type a comment below. Some of the steps below will require you to close this webpage. So, please read the tutorial carefully, after that bookmark or print it for later reference. The step-by-step guidance will help you remove Click.admessage.support popups. These Click.admessage.support removal steps work for the MS Edge, Firefox, Microsoft Internet Explorer and Google Chrome, as well as every version of OS. First method for manual ad supported software removal is to go into the Windows “Control Panel”, then “Uninstall a program” console. Take a look at the list of programs on your computer and see if there are any suspicious and unknown software. If you see any, you need to uninstall them. Of course, before doing so, you can do an World Wide Web search to find details on the program. If it is a potentially unwanted application, adware or malicious software, you will likely find information that says so. It will show a list of all applications installed on your system. Scroll through the all list, and remove any questionable and unknown programs. To quickly find the latest installed apps, we recommend sort applications by date in the Control panel. If the Firefox settings such as default search engine, new tab and homepage have been modified by the adware, then resetting it to the default state can help. However, your saved bookmarks and passwords will not be lost. This will not affect your history, passwords, bookmarks, and other saved data. It will open the confirmation prompt. Further, press the “Refresh Firefox” button. The Mozilla Firefox will start a task to fix your problems that caused by the Click.admessage.support adware. After, it is finished, click the “Finish” button. The adware can modify your Google Chrome settings without your knowledge. You may see an undesired web site as your search engine or startpage, additional extensions and toolbars. Reset Chrome internet browser will help you to delete Click.admessage.support advertisements and reset the unwanted changes caused by adware. Essential information like bookmarks, browsing history, passwords, cookies, auto-fill data and personal dictionaries will not be removed. 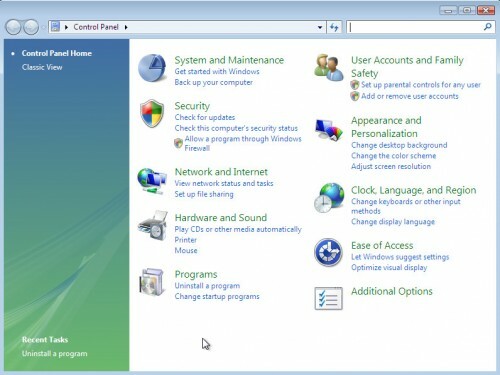 In order to restore all web-browser new tab, default search engine and start page you need to reset the IE to the state, that was when the Windows was installed on your system. You will now need to reboot your computer for the changes to take effect. It will remove adware that causes web browsers to show annoying Click.admessage.support advertisements, disable malicious and ad-supported internet browser’s extensions and restore the Microsoft Internet Explorer’s settings like start page, new tab page and default search engine to default state. It is very difficult for classic antivirus software to detect adware and other kinds of PUPs. We suggest you run a free anti-adware such as Zemana, MalwareBytes Free and Hitman Pro from our list below. These tools will allow you scan and remove trojans, malware, spyware, keyloggers, bothersome and malicious adware from an infected computer. You can download and use the Zemana Anti Malware (ZAM) for free. This anti-malware utility will scan all the Microsoft Windows registry entries and files in your computer along with the system settings and web browser extensions. If it finds any malicious software, adware or harmful extension that is responsible for internet browser reroute to the unwanted Click.admessage.support webpage then the Zemana Free will remove them from your computer completely. Once downloading is done, close all software and windows on your personal computer. Open a directory in which you saved it. Double-click on the icon that’s called Zemana.AntiMalware.Setup as displayed in the figure below. When the install starts, you will see the “Setup wizard” which will help you install Zemana Anti-Malware on your PC system. Now click the “Scan” button . Zemana program will scan through the whole computer for the adware related to Click.admessage.support pop-up ads. Depending on your computer, the scan can take anywhere from a few minutes to close to an hour. When a malicious software, ad supported software or potentially unwanted software are found, the number of the security threats will change accordingly. When the scan get completed, Zemana Anti-Malware will prepare a list of unwanted programs adware. Make sure all items have ‘checkmark’ and click “Next” button. The Zemana AntiMalware (ZAM) will delete adware which cause unwanted Click.admessage.support pop ups to appear. We recommend to install an ad blocking program which may block Click.admessage.support pop-ups and other unwanted web sites. The ad-blocker tool like AdGuard is a application that basically removes advertising from the World Wide Web and blocks access to malicious web sites. Moreover, security experts says that using ad-blocker software is necessary to stay safe when surfing the Internet. Please go to the link below to download the latest version of AdGuard for Microsoft Windows. Save it on your Desktop. Each time, when you start your PC system, AdGuard will run automatically and stop unwanted advertisements, block Click.admessage.support, as well as other malicious or misleading web sites. For an overview of all the features of the program, or to change its settings you can simply double-click on the AdGuard icon, that is located on your desktop. Many software developed to show lots of unwanted advertisements within your computer’s browser. So, when you installing free programs, carefully read the disclaimers, select the Custom or Advanced install method to watch for bundled programs that are being installed, because some of the apps are PUPs like this ad-supported software which redirects your internet browser to the intrusive Click.admessage.support site. Now your PC system should be clean of the adware that causes internet browsers to open unwanted Click.admessage.support pop ups. We suggest that you keep Zemana (to periodically scan your system for new adwares and other malicious software) and AdGuard (to help you stop annoying popup ads and harmful web-sites). Moreover, to prevent any ad supported software, please stay clear of unknown and third party applications, make sure that your antivirus program, turn on the option to scan for potentially unwanted applications. If you need more help with Click.admessage.support pop-up ads related issues, go to here.